A white, waxy coat may help this ladybug larva survive attacks from would-be predators. The adult Hyperaspis ladybug searches for prey near a mound of scale insects. My rebuke may have been a little extreme. This ladybug (a.k.a. lady beetle, ladybird beetle) larva, Hyperaspis, really looks much more like a mealybug than a lady beetle. Cases of mistaken identity surround this predator insect and I am certain that many of these fine beneficial insects are killed unnecessarily each year. The larva of Hyperaspis produces wax from glands lining its sides. This wax is more than a way to be styling. 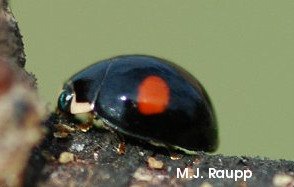 Studies of related species of waxy ladybugs reveal that the wax reduces the effectiveness of ants and other predators that might like to make a meal of a ladybug larva. In this way, the wax serves much like the trash carrying lacewing larvae we met in “A wolf in sheep’s clothing”, April 10, 2006. One fairly easy way to distinguish the larva of this beneficial ladybug from pesky mealybugs is to give it a little poke in the behind. Mealybugs tend to stay in one place and move slowly. Ladybug larvae usually amble away quickly when disturbed. 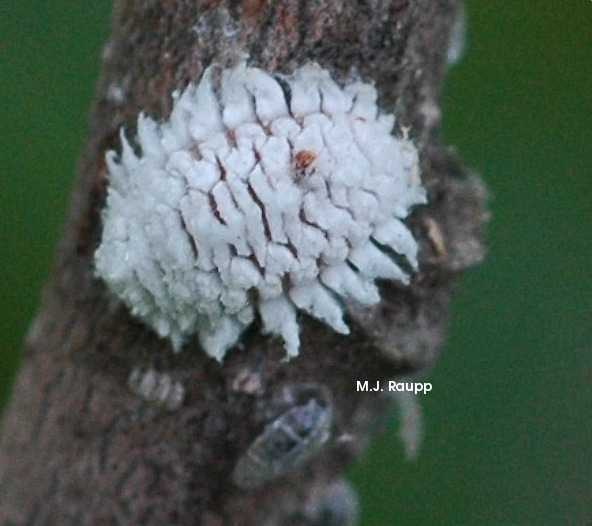 The waxy larvae may eat several thousand immature scale insects during the course of development and the adult beetles consume many harmful scales too. During autumn, larvae complete development and become adults. Although the larva of Hyperaspis is deceptive, the adult beetle is easily recognized. It is a gorgeous black beetle with two red spots adorning its wing covers. Some species of Hyperaspis have combinations of yellowish spots or stripes on their back. By early December, adults have departed scale-infested trees to spend the winter in protected locations beneath bark or in leaf litter on the ground. Next spring, they will return to your scale-infested trees and lay eggs that will hatch into stealthy, wax-cloaked larvae. Keep an eye out for these small masters of disguise and when you see them, do not spray them with insecticides. They are working for you!